Today I want to share my favorite cake substitute, that perfectly fits to a low-carb and/or paleo diet. Everyone who follows a strict low-carb or paleo diet is familiar with this situation. You are invited to a birthday party or a family come-together where you can find a huge, mouthwatering cake selection. Anyone else enjoys the tast of this delicious sugarbombs and you really want to stay strong, but it's getting harder and harder. So why not supply an alternative that you can eat with good consience? 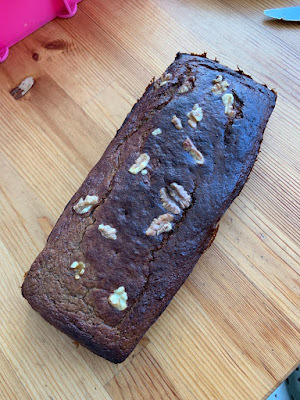 You can enjoy some tasty slices as well with this awesome banana bread and your scale won't sentence you the day after. Additionally you consume a lot of healthy minerals, Omega-3-acids, anti-inflammation substances, healthy protein and dietary fibers while you enjoy the taste of amazing cake with your family and friends. Here's the (really easy) recipe that transforms you to the cake boss of the healthy and fit. - Preheat the oven to 350°F (175°C). - Smash the bananas with a fork. - Put all ingredients (except walnuts) together into a bowl or blender and mix them properly until you get a creamy dough. - Grease a baking pan with fat (e.g. butter) and pour the dough into it. - Decorate it with some walnuts. - Bake it for approx. 30 to 35 min. in the oven. Low-Carb Banana Bread at it's finest! Directly tried it out and you're right...it's soooo delicious. Thank you. I’m happy that you like it!